Download today. 30-day money back guarantee. Investors want to understand how your company is going to deliver in a marketplace full of competitors. Show them a dynamic presentation that is inspiring and without the usual long blocks of bullet points. Use our templates to create eye-catching and highly persuasive pitch deck with ease. Unlike others, our template structure is based on an analysis of 70+ of the top startup pitch decks from many different industries. Every slide comes with the example of our company's story. This way you won't even have to think twice about what to write. I expect a pitch deck to be accurate, simple and well structured. It must follow a storyline and speak to the personality of the brand. Pitch Deck Template delivered everything I asked for and more! Our template is now available in two versions. Presentation version is what supports your verbal pitch and designed to be as to the point and simple as possible. The reading version is a more detailed overview of your startup and what you can use to send over email. I've been searching for something like this and I'm glad I finally found it. I love the way you walk through the process and layout of each chapter. The template is AWESOME. Build a pitch deck you can be confident will sell your investors, with our 100 zero-hassle premade eye-catching slides. They cover every essential pitch deck element you could think of. And as a bonus, you'll get a library of 700 built-in icons, popular device mockups and maps. It's a real one stop shop. Using Pitch Deck Template allowed me to focus on research and data and worry less on the deck design. Excellent value for the dollar. Thanks! You have full range with every element of the template. So you can create a pitch deck that's as unique as your business. All you need to get started is PowerPoint, Keynote, or Google Slides. (pro-tip: google slides is totally free to use). I absolutely love the template. I am not a super PowerPoint user, but editing the template was so simple! We want you to be certain that Pitch Deck Template is right for you. Click below and preview all slides and color options available in our templates. I'm always amazed by what you've made available as a resource. I've gone from using Pitch Deck Template for personal business use, to helping out other colleagues... and even my clients! 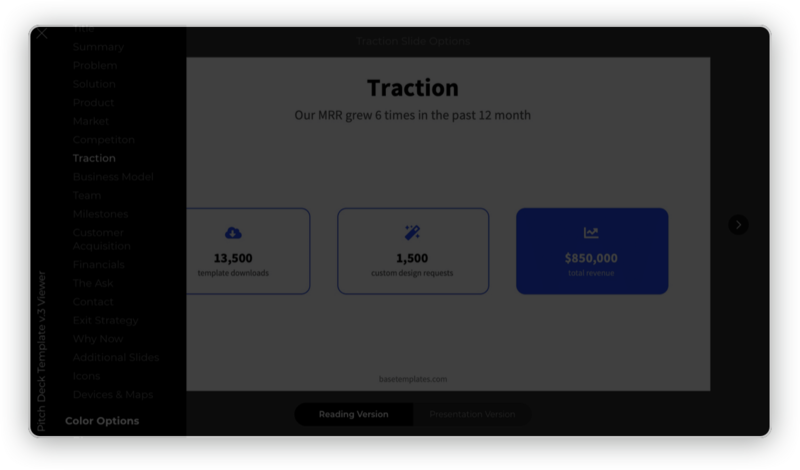 We've Created The World's Leading Pitch Deck Development Tool. It's loved by 400+ happy customers, from startup founders to top university professors. And supported by 800+ votes on ProductHunt. Pitch Deck Template helped me to realize the best ways to pitch my concept! I hardly had to work, they give you all the ideas. Let them see what a rockstar company are you going to start. Download Pitch Deck Template today.